YOU ARE LOOKING AT A 2016-17 UD Black Lustrous INK Gold Spectrum Relics #LIBE Brian Elliott 34/99 card. To CANADA. You will receive the actual card pictured above. You are purchasing a 2007-2008 SPX Brian Ellitott Autographed Rookie card. Card #226. The card is serially numbered 706/999. The card is in Near Mint - Mint condition. The card features a beautiful 2 colour jersey patch. You are purchasing a 2007-2008 The Cup Brian Elliott Autographed Jersey Patch Rookie Card. Card #152. The card is serially numbered 046/249. The card is in Near Mint - Mint condition. 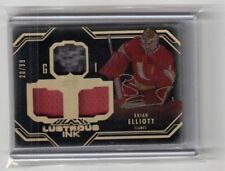 You are purchasing a 2007-2008 The Cup Brian Elliott Autographed Jersey Patch Rookie Card. Card #152. The card is serially numbered 123/249. The card is in Near Mint - Mint condition. You are purchasing a 2007-2008 The Cup Brian Elliott Autographed Jersey Patch Rookie Card. Card #152. The card is serially numbered 181/249. The card is in Near Mint - Mint condition. You are purchasing a 2007-2008 The Cup Brian Elliott Autographed Jersey Patch Rookie Card. Card #152. The card is serially numbered 077/249. The card is in Near Mint - Mint condition. YOU ARE LOOKING AT A2009 -10 O-PEE-CHEE BRIAN ELLIOTT RETRO RAINBOW. CARD NUMBER #258. To CANADA. You are purchasing a 2007-2008 The Cup Brian Elliott Autographed Jersey Patch Rookie Card. Card #152. The card is serially numbered 141/249. The card is in Near Mint - Mint condition. Rare insert from the 2012-13 Black Diamond set. These cards were a super tough pull and serial numbered out of 100. You are purchasing a 2007-2008 The Cup Brian Elliott Autographed Jersey Patch Rookie Card. Card #152. The card is serially numbered 248/249. 2013-14 PANINI TITANIUM BRIAN ELLIOTT AUTO DUAL PATCH 05/25!! UP FOR SALE IS A2013-14 PANINI TITANIUM BRIAN ELLIOTT AUTO DUAL PATCH 05/25! 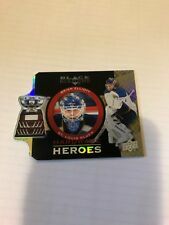 YOU ARE LOOKING AT A2012-13 BLACK DIAMOND BRIAN ELLIOTT HARDWARE HEROES CARD. CARD NUMBER #HH-BE. To CANADA. You are purchasing a 2007-2008 The Cup Brian Elliott Autographed Jersey Patch Rookie Card. Card #152. The card is serially numbered 106/249. The card is in Near Mint - Mint condition. 2010-11 PANINI CERTIFIED MASKED MARVELS NUMBERED PARALLEL CARD. BRIAN ELLIOTT. You are purchasing a 2007-2008 SP Authentic Brian Ellitott Autographed Rookie card. Card #234. The card is serially numbered /999. The card is in Near Mint - Mint condition. You are purchasing a 2007-2008 The Cup Brian Elliott Autographed Jersey Patch Rookie Card. Card #152. The card is serially numbered 133/249. The card is in Near Mint - Mint condition. 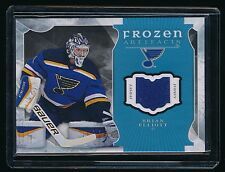 You are purchasing a 2007-2008 The Cup Brian Elliott Autographed Jersey Patch Rookie Card. Card #152. The card is serially numbered 202/249. The card is in Near Mint - Mint condition. You are purchasing a 2007-2008 Ultimate Brian Ellitott Autographed Rookie card. Card #148. The card is serially numbered /399. Brian Elliott, Jonathan Quick, Mike Smith. Jersey Card # 7. First Card. •Orders may be. Canadian Residents must Add GST or HST on final cost . Country Service Available. Yukon (YT):----------------------5.00%. YOU ARE LOOKING AT A2010-11 CERTIFIED BRIAN ELLIOTT MIRROR BLUE JERSEY C A RD. CARD NUMBER #103. To CANADA. 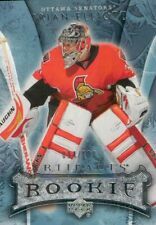 You are purchasing a 2007-2008 The Cup Brian Elliott Autographed Jersey Patch Rookie Card. Card #152. The card is serially numbered 056/249. The card is in Near Mint - Mint condition. You are purchasing a 2007-2008 SPX Brian Ellitott Autographed Rookie card. Card #226. The card is serially numbered /999. The card is in Near Mint - Mint condition and features a red jersey patch. This is what you are viewing a2010-11 LIMITED BRIAN ELLIOTT THREADS JERSEY. The card number is 122. To CANADA. The card number is 166. To CANADA. Brian Elliott 058/100 card. To CANADA. 058/100. YOU ARE LOOKING AT A2007-08 ULTIMATE COLLECTION BRIAN ELLIOTT ULTIMATE DEBUT THREADS CARD. ULTIMATE SPORTSCARDS. To CANADA. Up for auction is a Brian Elliott autographed Printing Plate (Y-234) Yellow Plate. Great looking card and great looking Auto!!! Shipping in USA is free (includes tracking) Shipping to Europe/Canada is $24 via Registered mail, the cheapest way to ship international with tracking (which costs 24 US$) Ships in Top Loader with Penny Sleeve (as shown in Photo), wrapped securely, in padded envelope. Card is MINT. Card is #152 and is #180 of 249. A great card to add to your collection. Sorry, no exceptions. This is for INTERNATIONAL ORDERS ONLY.